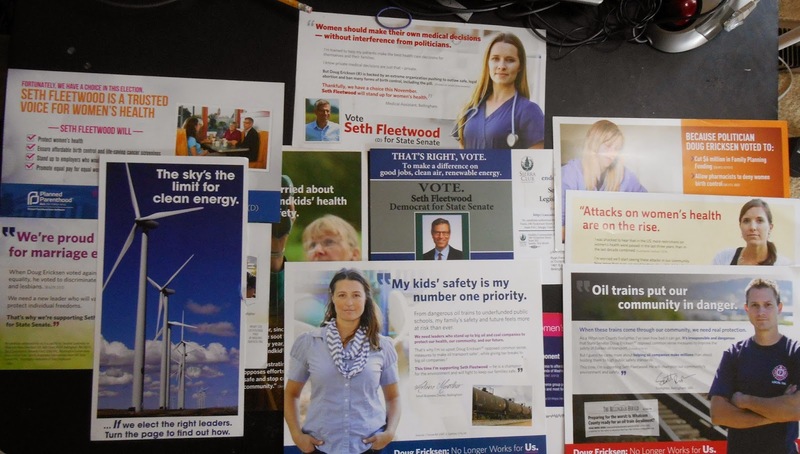 Below are montages (click to enlarge) of the collected 30 placard flyers we have received from those people who support Seth Fleetwood and those people who do not support Seth Fleetwood (e.g. probably support Doug Ericksen) for state Senator in WA 42 LD. This district of 85K voters will have well over a $1M spent on just these two men's campaigns by the time this is over. You will notice that the thirteen pro Seth Fleetwood flyers I receive are almost all positive in tone. They generally involve not only interest groups I know, but community members I know as well. The woman with the quote "My kids safety is my number one priority" is the owner (Arlene Mantha) of 250 Flora, arguably one of the better lunch experiences in Bellingham, WA. I know for certain that she cares about children, because she feeds my son Rory every time we visit the Whatcom Children's Museum. "All these years of being involved with the PTA at my children's school", she said almost apologetically to me one lunch. "It leads you to become involved on a political level". Of course it does. Public schools need funding and parents need political champions to fund their schools. As a voter, I can readily believe a Democrat like Seth Fleetwood will champion education and social services. Now let us look at the truly scary and (as far as I am concerned) mostly defamatory seventeen pieces of flack that have been delivered to my mail box from the people who ostensibly support Senator Doug Ericksen. I say ostensibly because there is little in any of these advertisements that actually tells me what Doug Ericksen has done in all his years in the Senate. There are a lot of nasty pictures of Seth: Seth as the flake, Seth as hungover, Seth as the tax increaser, Seth as the carpetbagger, Seth as Pinocchio for heaven's sake.... Almost every placard is dagger of character assassination with scant proof for the assertions; assertions which I can recognize as created from dubious logical conclusions to begin with. For example, all politicians are forced to raise taxes in an inflationary driven economy, otherwise good people would simply stop training to become cops, firemen and teachers! No, Seth Fleetwood (as a state Senator) will not be able to control, in any meaningful way, the price of heating oil or gasoline. Energy is a fungible worldwide economy whose price is controlled but it is really improbable that anybody who helps control the price of energy will ever run for state senator! Your state senator is your "go to" person to help your community fund its development, downtown, waterfront, industry,agriculture, tourism, retail, schools, emergency services,etc. I simply have no idea from these advertisements how Senator Ericksen has ever done this for me. All I know from these advertisements is that the people who support Senator Ericksen detest Seth Fleetwood. It might well be that Senator Ericksen has been far more effective and more bipartisan than he has been portrayed by Democrats and their interest groups. But how am I supposed to know this? I'm voting for Seth Fleetwood not just because I distrust most Republicans these days, but because people I know believe in him. Please remember to vote!